All rugs and carpets require specific care in order to keep their appearance and lengthen their lifespan.There is minor but important differences in caring for machine made and handmade rugs, if done properly you can add considerable life to your rug. Some rugs have manufacturers care labels attached when purchased so you should always read and follow the supplier’s guidelines and recommendations. Avoid your rug (and floors) getting dirty by protecting entrances to your home with dedicated barrier mats. If possible rotate your rug periodically to distribute the areas of heavy traffic. We also recommend the use of a rug underlay to prevent colour transfer onto existing floor coverings and hard floors, rucking problems and tripping hazards on hard flooring. With these rugs suction-only type of vacuum should be used. You should never use a beater bar on the surface of these types of rugs.If you are using an upright vacuum with a beater action ensure the brushes are on the highest setting and just skimming the surface of the rug. Handknotted rugs should occasionally be placed pile side down,vacuum the back of the rug , turn pile up and re vacuum,this loosens ingrained dirt particles from the base of the pile and will extend the life and appearance of the rug. Fringes can be straightened out by hand with a comb or soft brush or with the use of the vacuum tools using a single motion away from the rug. For shaggy rugs shake the rug to loosen any grit or loose fibres and by using tools on the lowest setting it will help to minimise the excessive shedding usually associated with these types of rugs, especially the felted wool fibres. These types of rugs with a cut pile should be vacuumed with cleaners that have beater bars. This will keep the pile upright and loosen any grit in the base of the pile. Periodically, the rug should be turned pile down and the back of the rug should be vacuumed with an upright cleaner. The beater bar set low to loosen any grit in the pile. The rug should then be turned the correct way and vacuumed as above. For these rugs a ’suction only’ type of vacuum should be used. It is important to never use a beater bar on the surface of these types of rugs.Natural plant fibre rugs react badly with moisure and should never be over wetted ,even clear water can stain these types of rugs. Firstly, you should never rub the surface pile of a rug. The correct way to approach a spillage or mark is to blot the area with a clean, absorbent cloth or white paper towel. Try not to make the spillage area larger. Secondly, you should scrape up any excess spillage with a blunt knife or spatula. Before using any cleaning products on your rug, you should always ’spot test’ the rug to ensure the solution you are using will not damage or bleach the fibres of the rug. 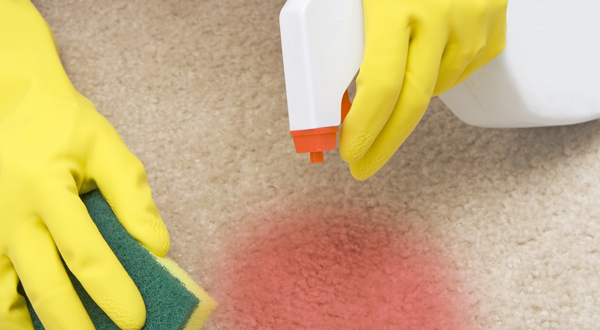 Washing up liquid, abrasive cleaners or caustic solutions (including some carpet cleaning products) contain bleaching agents and these can damage the pile of your rug, so it’s important to find the correct cleaning solution. Always brush the pile so the affected area is the same direction as the rest of the rug (A normal comb is very good for this as it separates the tufts and helps prevent a matted appearance). If you are not confident in tackling a spill seek professional advice.